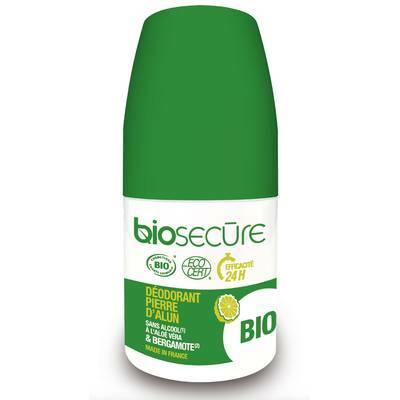 Alcohol-free and containing 100% natural alum stone, this Biosecure Deodorant combats unpleasant odours. It leaves a gentle fragrance, dries rapidly and does not leave white marks on clothing. Its main active ingredient, aloevera, moisturises even sensitive and epilated skin. Available in bergamot or pomegranate fragrances. AQUA (WATER), ALOE BARBADENSIS LEAF JUICE* POTASSIUM ALUM, GLYCERIN, MAGNESIUM ALUMINUM SILICATE (MONTMORILLONITE)(BENTONITE), BENZYL ALCOHOL, XANTHAN GUM, CAPRYLYL/CAPRYL GLUCOSIDE, PARFUM (FRAGRANCE), LIMONENE, LINALOOL.